(Jan. 29, 2019) Bridgetown. That’s our city. 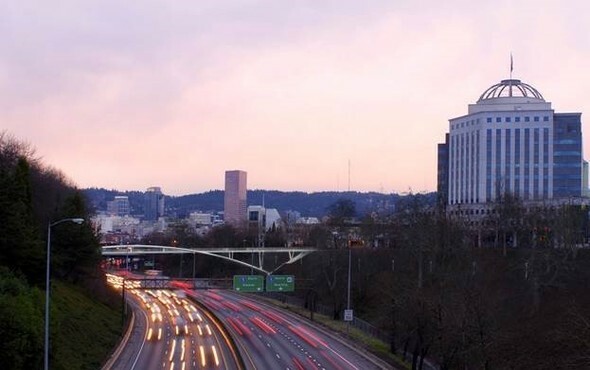 In fact, the Portland Bureau of Transportation (PBOT) already manages 152 different bridges across the city – many of which are 75 to 100 years old, or older! As our city grows, PBOT is actively working to build new bridges or update old ones to better serve people walking, biking and driving. In 2019, the bureau will open one rebuilt bridge and begin construction on two new, highly anticipated bridges with a fourth bridge on the horizon. All of these will help connect neighborhoods and make it easier to get around Portland. 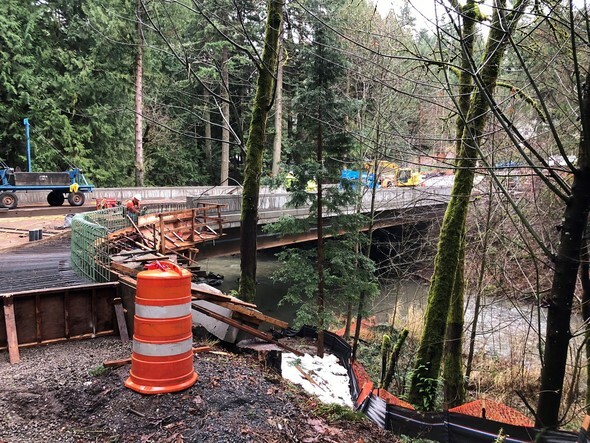 The SE 122nd Avenue Bridge over Johnson Creek during construction in January 2019. Photo by Cameron Glasgow, Portland Bureau of Transportation. In December 2015, a severe record-breaking storm damaged the SE 122nd Avenue Bridge over Johnson Creek. Damage to the 57-year-old timber bridge was so extensive, it required a complete replacement. A new steel plate girder bridge will span the entire width of the creek to lower the risk of future storm damage. This new bridge will feature ADA-compliant sidewalks and safe access for pedestrians on both sides of the bridge. The bridge was also designed to blend into the natural beauty of the area, with leaves of grass decorating the railings. PBOT is nearing completion and expects to open the bridge in early March 2019. The bureau thanks all nearby residents and businesses for their patience during the closure of this important crossing. An illustration of the future Sullivan's Crossing pedestrian and bicycle bridge over I-84. 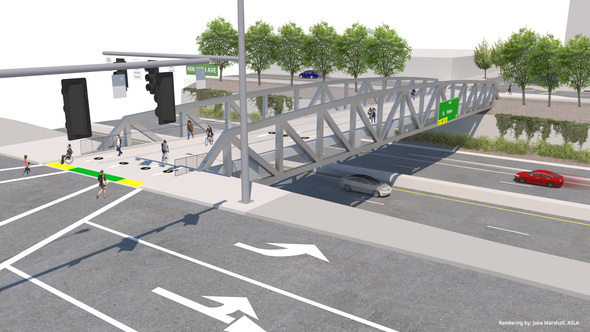 Sullivan’s Crossing is a walking and biking bridge that will provide a vital connection over Interstate 84 between the Central Eastside and Lloyd districts at NE Seventh Avenue. Design work is nearly complete and PBOT has contracted with Oregon-based HP Civil to oversee construction. HP Civil has extensive experience in bridge construction. A final contract will head to City Council for approval in June. PBOT expects the 18-month project to break ground August 2019 and open to the public in early 2021. An illustration of the future Rivergate Overcrossing in North Portland. Rivergate Overcrossing is a new bridge over rail tracks on N Rivergate Boulevard. This new connection will provide access to several large businesses including Evraz Oregon Steel Mills. This $26 million bridge is funded through a Transportation Investment Generating Economic Recovery (TIGER) grant awarded to the Port of Portland in 2016 by the Federal Highway Administration. PBOT is completing final designs and expects the project to begin construction in June 2019. The new Rivergate Overcrossing should be completed December 2020. An illustration of the future Flanders Crossing over I-405 in NW Portland. Although construction will not begin in 2019, stay tuned for updates on Flanders Crossing, a new walking and biking bridge that will connect NW Flanders over Interstate 405. Flanders Crossing will provide the residents of the Northwest and Pearl districts a more direct, safe crossing over I‐405. The new bridge will also provide a seismic-resilient route for emergency vehicles in the event of an earthquake. In 2007, the city first identified NW Flanders Street (and its crossing over I-405) as a vital route with huge potential for walking and biking. Flanders Crossing was finally approved by City Council in 2017. Design is nearly complete. Construction should begin in late 2019 or early 2020. Sign up for updates about these projects and other PBOT projects and programs at www.portlandoregon.gov/transportation/subscribe.